You’re going over your calendar for the day, and you notice it’s time for your routine dental cleaning and check-up. Your day is so busy, and this appointment makes it so much more challenging, perhaps you should cancel. Your teeth aren’t hurting, and seeing the dentist once a year is enough, right? Wrong! Your six-month visits are very important and your trusted team at Dental Group West wants to tell you why you should regularly visit your dentist in Toledo. 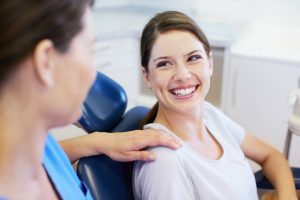 Over the years and through many studies we’ve learned that your oral health is truly connected to your overall health and well being. This is because we now understand that the bacteria causing periodontal (gum) disease, is the same bacteria contributing to issues such as diabetes, stroke, high blood pressure, cardiovascular disease, and vice versa. This is known as the oral systemic connection, and what it tells us is that there’s never been a more important time to take charge of your oral health. A few important things happen at your routine dental visits. The first is that your family dentist in Toledo performs a thorough examination and screens you for issues such as gum disease, oral cancer, tooth decay, and cavities at every check-up. This allows us to detect many of these issues in their earliest stages, which in turn gives you the opportunity to effectively treat these issues with less invasive treatment procedures. Next, our highly skilled hygienist will clean your teeth and remove the excess plaque that can cause these conditions. We’ll also take the time to educate you about your oral health so you can make the most of your home care routine. After all, you’re our best partner when it comes to maintaining your oral health. Gum disease occurs when excess plaque build-up causes your gum tissue to separate from your teeth, which allows harmful bacteria below your gum line. This bacteria causes an infection of your soft tissue and your bone, which is the support system and foundation for your teeth. If gum disease is left untreated, it will eventually destroy that support system and lead to tooth loss. By being proactive about your oral health with regular visits to your dentist, we can detect gum disease in its early stage, known as gingivitis. The good news is that gingivitis can often be treated with a thorough professional cleaning and improvements to your home care routine that our hygienists can teach you. If it’s time to schedule your next cleaning and check-up, don’t wait! Give us a call today to make your appointment. Your health is too important to ignore.